← Singham Returns … this time with Lady Singham and Daya!!! 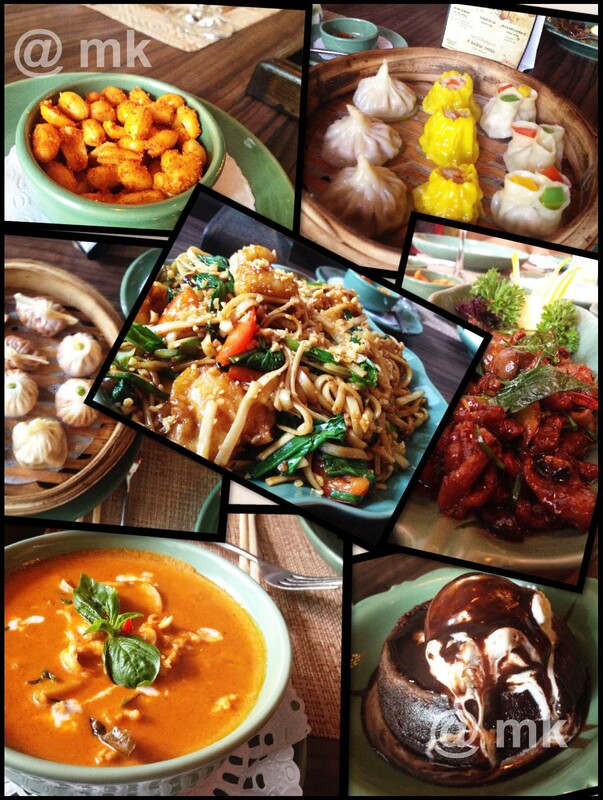 The China House … revival of the Chinese food we Delhiites love!!! A working day afternoon, a craving for Dimsums and some spicy Chinese, a suggestion by one of our food lover friends and lo we were at recently open China House by Q’BA. The impromptu food outings are one of the bests especially when you visit a place without too many “over the top” expectations and they surprise you with great ambiance, personalized service and most importantly yummy food. 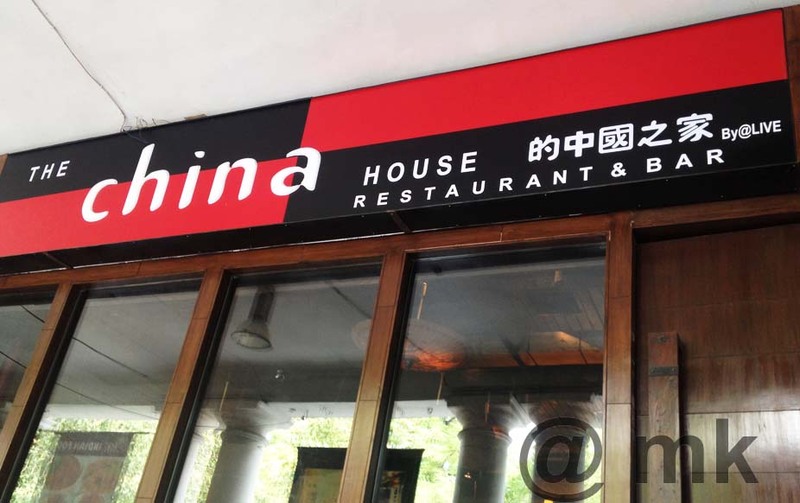 The China House is situated in the in the K- block of the outer circle of Connaught Place, next to the age-old Ginza restaurant. The bright red and black glow sign cannot be missed and if lucky you will get a parking just outside the restaurant, else you can go around and park in one of the radial roads on either side. Walking in the corridors of CP always has a nostalgic feel to it, whether you are visiting an old or a new place. The high ceilings among the colonnade transport back you to the British era and Sir Edwin Lutyen’s colonial design. The grand entrance to restaurants all add up to the old-world charm of this business district. The China house itself is adorned by a glass and teak wood elevation with a bold glow sign screaming its name. The interiors of the restaurant are chic, contextual and not loud at all. One notices the mezzanine at the rear side of the place, which is standard in all CP ground floor stores, a boon due to the high ceiling height of Lutyen’s Design. Though the design and the process gone in conceptualizing this place are quite evident as you walk in, the feeling of being welcomed into the restaurant has been achieved effectively. The tables close to the large windows (during lunch) have the luxury of natural light and alternatively, if you prefer the artificial slightly lower light tables, you can choose from the tables further down or on the mezzanine floor. I for one believe stores with high ceilings “kill it” by having the run of the mill false ceiling. China house’s designer has used the height intelligently giving it a bare, industrial look with exposed ducting and visible piping. The inverted Asian styled umbrellas add another dimension to the ceiling design and a well thought of detail. The walls are done in a rustic way with white brick style cladding, though a real brick worked wall painted white would have added to the chic decor. Overall, the white rustic walls adorned with metal orchids (from Thailand), the bare ceilings, wooden paneling and furniture define a comfortable and pleasing space that does not interfere with the experience of your food, but complements it. A smiling face and the body language of the host to the server, immediately puts the diner at ease and one is already looking forward to a good meal. Still new, the staff at China House is well trained, happy to be there (which is very important) and courteous to the demands. The people behind the place seem to have filtered down the fact that the servers need to be patient with the diners. 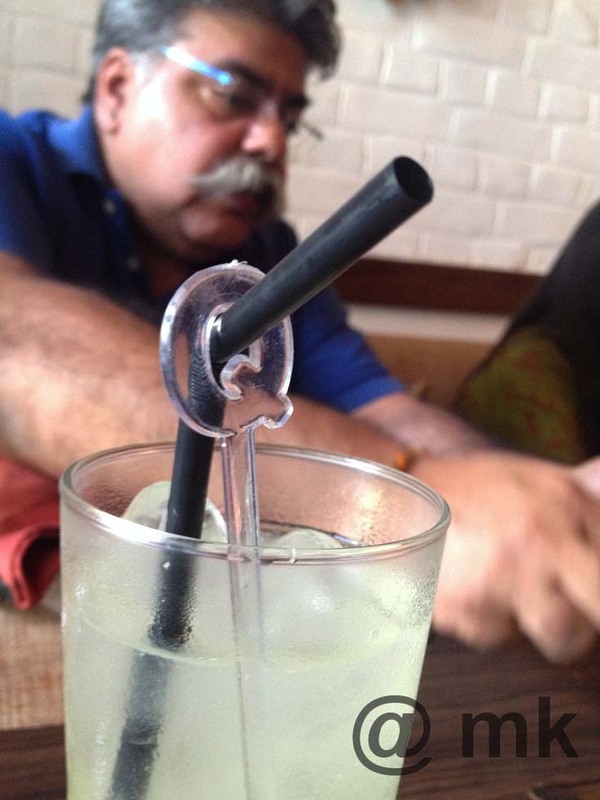 Chef Anil, was kind enough to visit us at our table and add to the suggestions made by the articulate server. A simple man with an unassuming demeanor the Chef, understands the North Indian love for spicy Chinese and is maintaining the balance between the Indian and the Asian cuisines to suit our desi preferences. A good décor and service with a smile is more than half the battle won from my side. I always believe happy people can never serve you bad food. 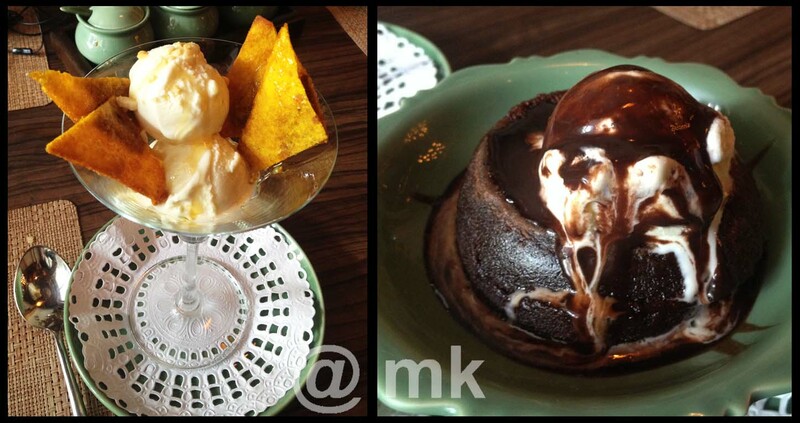 More than the ingredients it is the passion with which they cook and serve brings out the actual flavour of the food. Dimsums is what China House advertises with élan and so the smart choice was to start off with an assortment of dumplings. 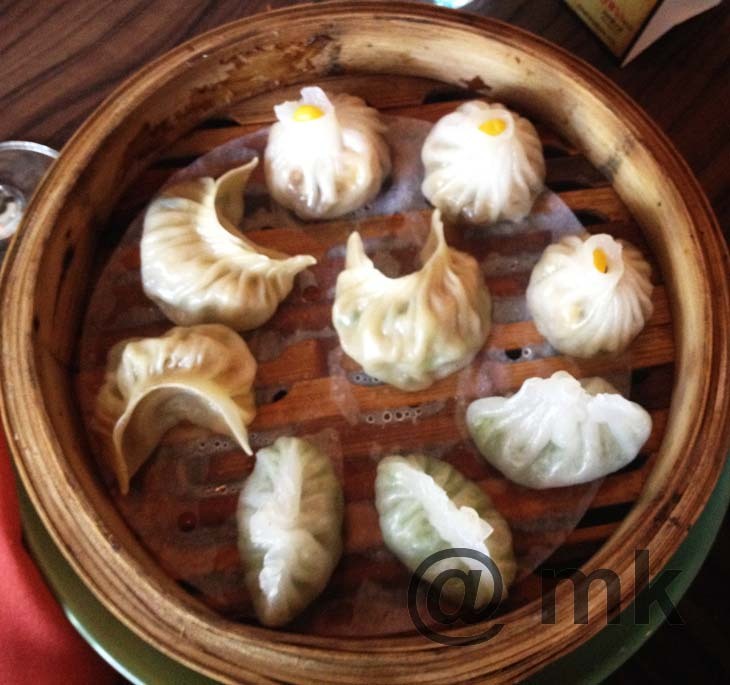 The Assortment consisted of Seven Spiced Chicken Dumplings, Garlic Chicken Dumplings, Chicken and Prawn Sui Mai, Shrimp with water chestnut Dumplings & Spicy lamb dumplings. 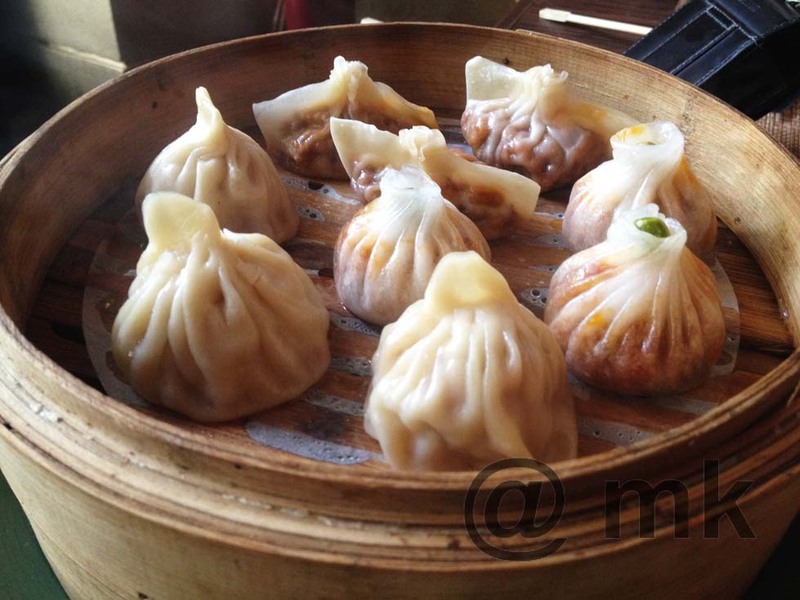 The dimsums were steamed and the meat cooked to complement the flavour rather than spoil it. Easily picked up by the chopsticks the experience of taking the whole dimsum in one go was a mélange of flavours exploding inside. Though the Shrimp and water chestnut rate high on the flavour scale, my favourite was the spicy lamb and if you are a meat lover like me, don’t miss this one for sure. The Chef did send us a variety of Veg Dimsums which I did eat to please him. But, if you follow my blog, you’d know vegetarian is something that I neither fancy eating nor writing about, sorry chef. 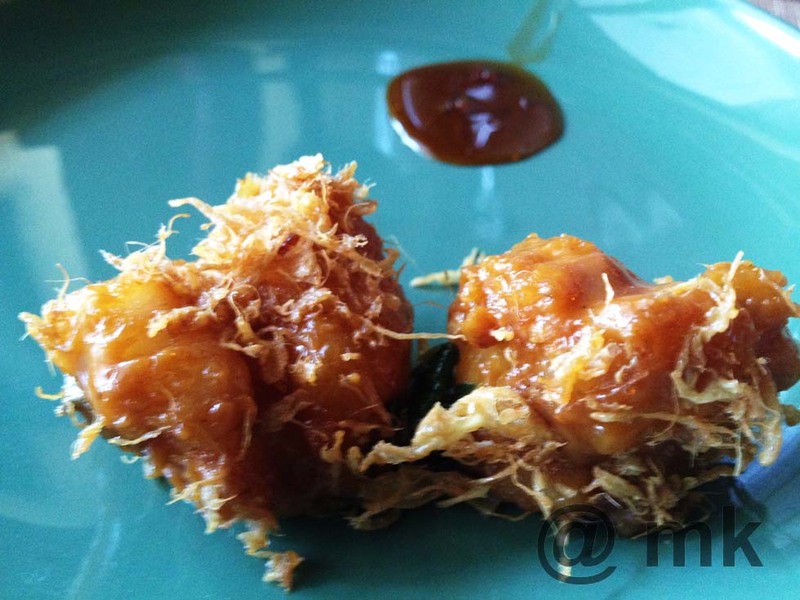 The next appetizer was the Garlic butter prawn, marinated in Butter milk and an Asian sauce covered with egg flakes. The prawns are fresh and full to bite into and the flavour explodes as soon as you dig your teeth into the individual bites. The butter milk marination keeps the spicy sauce in control and the twist makes them all the more delectable. 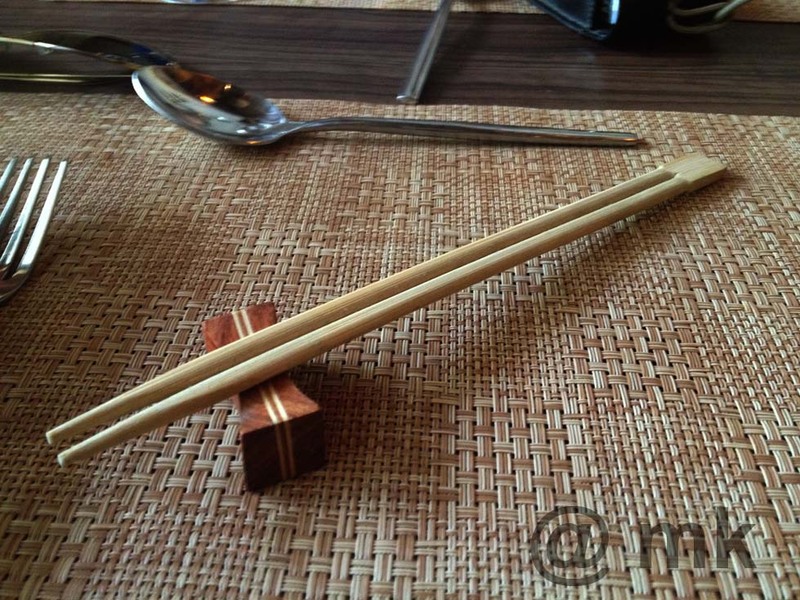 A must have to start your meal. One does need a breather when one has tried an assortment of 9 dimsums and a spicy starter and a fresh lime soda is the only thing which provided the much needed break from the constant munching of food we were downing. We did ask them to hold the main course but the prompt service ensured it was on our table as soon as we said the word “Go” again. 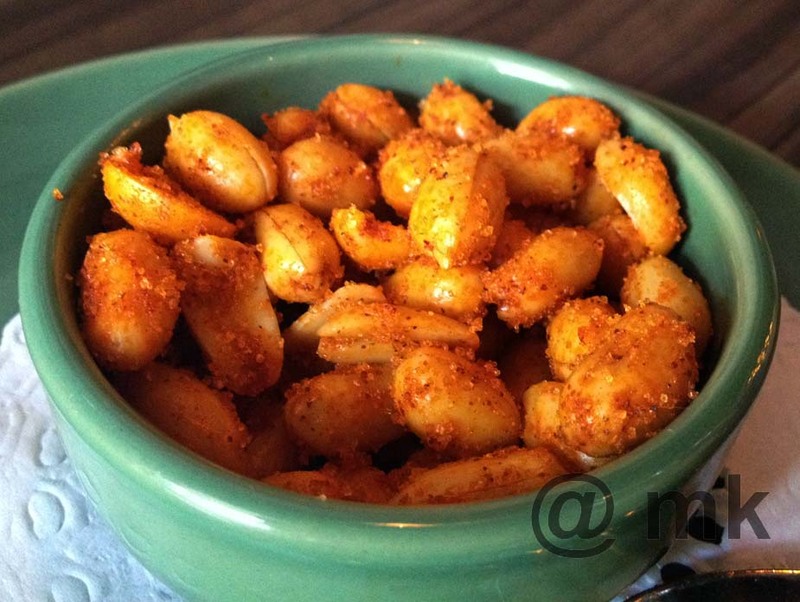 A special mention to the Chinese masala peanuts! A fresh lime soda did wonders with the amount of food we consumed! We had come mainly to gorge on the dumplings but then ended up ordering Chick in Red Thai Curry, steamed rice, Pork with Hot Basil and the Udon noodles with sliced fish in oyster sauce. Another marathon of food but we ensured nothing was left at the table or in the dishes. For the uninitiated Udon are thicker and flatter noodles, the origin of which are traced to Japan. China House served us the Wok fried with sliced fish in oyster sauce and lots of veggies. A dish which can be ordered and devoured all by itself, this one had the Indo-chinese taste to it and which I always prefer. The Wok fried Udon noodles with sliced fish in Oyster sauce! The Pork with Hot basil tastes even better than it looks in the pictures. I would recommend this one however, only if your palate loves to go beyond the normal person’s tolerance of spices. I was too enamoured by it and concentrated on eating it with some steamed rice without realizing that I never asked the chef how it was made. Pork my favourite kind of meat clubbed with the spicy oriental spices was nothing more I could have asked for. This is the one on the menu I will be going back for again and again. The Red Thai curry was alright and not bad, but we have all tasted it and either you like to eat it or you don’t, I sadly fall in the latter category. My fellow diner however gobbled up the entire bowl of Red curry with steamed rice. So if you love Thai curry I would recommend it here as my friend is somewhat a connoisseur on food and his finishing the whole bowl means a lot. 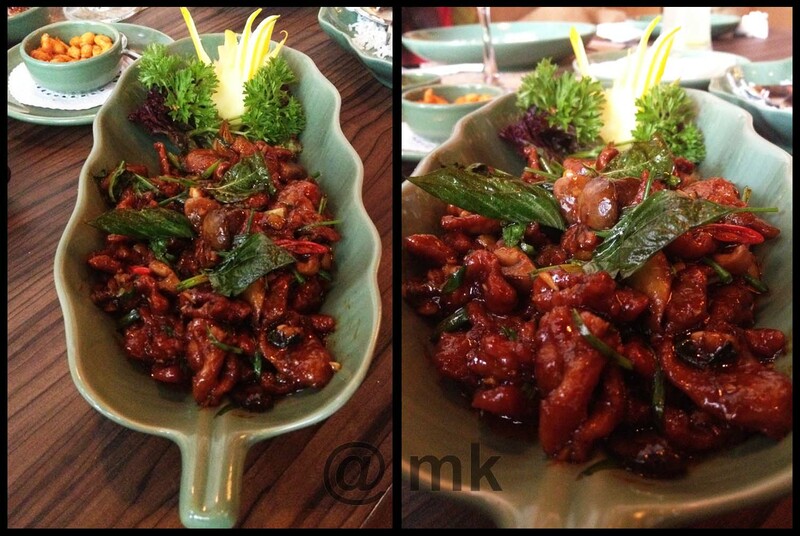 Pork with Hot Basil … one dish I would go back again and again for! Just when we thought we were done and ready to leave, the Chef announced that since we were so well behaved and finished all our food, we deserved desserts on the house and so he unleashed his two stars the Figs & Dates Pancake with Vanilla ice-cream & the usual Brownie with vanilla ice-cream. The crispy pancakes with the soft Vanilla ice-cream were complementing each other so well, that I finished half of it and realized that I do not even like pancakes. Having smelt the piping hot chocolate brownie I moved away from the pancakes and dived right into the hot ceramic dish with the ice-cream and brownie (be careful with the dish because it is extremely hot). The ice-cream and chocolate sauce were melting onto the extra warm and soft brownie and no matter how many versions of this dessert I have tried, people are always experimenting with how they serve it much to my pleasure. I would say China house is stylish but not over the top, the Chinese food sits well on the North Indian palate, but be ready for some surprises along your meal. I am definitely going back for more! The meal left me more than satisfied and though I knew I’d have to run that extra mile to shed the extra fat, I felt happy about it. A meal that would set you back by Rs. 1200/ person and a place where you can go regularly. This entry was posted in Food, Lifestyle, Photography, Restaurant, Review, Travel, Uncategorized and tagged Chicken, Chinese food, Desserts, Dimsums, Dumplings, Fish, Noodles, Pork, Prawns, Red Thai Curry, Thai, Udon. Bookmark the permalink.